Theology and spirituality. The active understanding of theology and spirituality in relation to the Christian life of prayer, devotion, worship and celebration. After the apostles. The establishment of a tradition with reference to the writings of the Church Fathers. The development of orthodox doctrine and practices illustrated from the Coptic and Armenian Fathers, and the Greek and Russian tradition. The Middle Ages. The works of Bernard, Catherine of Sienna, Thomas a Kempis, and Thomas Aquinas; mediaeval movements of spirituality – the Benedictines, Franciscans. The Protestant tradition. Protestant theology from the works of Luther, Calvin and Zwingli. The contribution of hymnology, music and scripture. The Counter Reformation. The spread of Jesuitism and Gregorian spirituality. The Evangelical revival The theology of the 18th century. The Quaker and Puritan contributions. Spiritual perspectives in Christian poetry and music across Europe. Nineteenth-century perspectives. The growth of the Salvation Army and movements of social reform. Victorian moralists, preachers and reformers of applied theology/spiritual development. Contemporary theology and spirituality. The ecumenical movement, liberation theology. The concept of world embracing spirituality, political wholeness, revolutionary spirituality. New spiritual movements and communities; the spirituality of poetry and literature. 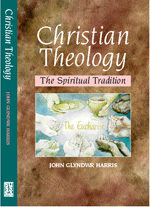 Dr Harris brings to his task a long a rich career in theology and education. There is immense learning and great erudition. A welcome introduction to the heart of Christian believing and its story from the emergence of the New Testament and early Christian thought to the ecumenical diversity of the world Church as it enters in the new millennium.